How would you describe your relationship with food? How do you know what to cook, what guides you? 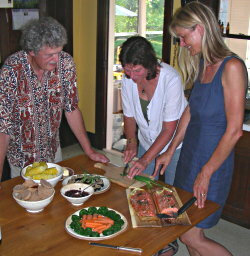 Private or group cooking classes and seminars are offered in my home and throughout the United States. Please contact info@cookingfortheloveoftheworld.com for information and fees. Go to Wise Woman University for over 36 online classes with 20 different mentors. The Wise Woman University is a sacred distance learning center that encourages personal empowerment. Currently I am offering two courses; Cooking for the Love of Children and Culturing from the Heart.